AN ACT of Parliament to give effect to Articles 109 (5), 110 (3) and 114 of the Constitution; to provide procedure for the Speakers of the National Assembly and the Senate to determine the nature of a Bill; and for connected purposes. 1. This Act may be cited as the Determination of the Nature of Bills (Procedure) Act, 2018. “Speaker” means the Speaker of the National Assembly or the Senate. (c) a framework for resolving a dispute as to whether a Bill concerns counties. 4. This Act applies to all Bills originating in the National Assembly and the Senate. (b) if it concerns counties, whether it is a special or an ordinary Bill. (2) The Speaker from whom concurrence is sought under subsection (1) shall respond to the request for concurrence within a period of seven days from the date of receipt of the request. (3) Where no response is received within the period specified under subsection (2), the Speaker of the House originating the Bill may direct that the Bill be Read a First time. 6. (1) Where the Speakers of both Houses fail to concur on the nature of a Bill as provided in section 5, the Speakers shall refer the Bill to a Joint Committee established to determine the nature of the Bill. (2) Each Speaker shall appoint, from amongst members of the respective House, three members to sit in the Joint Committee. (3) The Joint Committee shall, at its first meeting, elect a chairperson and a vice-chairperson from amongst its members. (4) The chairperson and vice-chairperson shall not be members of the same House. (5) In the absence of the chairperson or the vice-chairperson at a meeting of the Joint Committee, the members of the Joint Committee shall elect, from amongst its membership, a person to chair that meeting. (6) The quorum of any meeting of the Joint Committee shall be at least two members from the National Assembly and two members from the Senate. (7) The Clerks of the Houses of Parliament shall be the joint secretaries to the Joint Committee. (b) is a Bill referred to in Chapter Twelve of the Constitution affecting the finances of county governments. (f) provides for any other matter that would affect the functions and powers of the county governments. (x) any other matter referred to in Chapter Twelve of the Constitution affecting the finances of county governments. (ii) the annual County Allocation of Revenue Bill. (e) matters incidental to any of the matters specified under paragraphs (a) to (d). (d) the raising or guaranteeing of any loan or its repayment by a county government. 11. Within five days of receipt of a report of the Joint Committee under section 7 (1), the Speakers of the respective Houses shall each signify on a certificate of joint concurrence in the form set out under the Schedule on whether they concur with the recommendations contained in the report of the Joint Committee on the nature of the Bill. the Joint Committee shall prepare a report to the Speakers requesting Parliament to refer the Bill to the Supreme Court for advisory opinion on the matter. House and shall be processed in accordance with the Constitution and the standing orders of that House. 14. When a Bill concerning county governments is referred to a House of Parliament pursuant to Article 110 (4) of the Constitution, and the relevant House fails to pass the Bill in one Session, the Bill shall be processed in accordance with Article 113 of the Constitution. 15. A Bill presented for presidential assent shall be accompanied with a certificate of joint concurrence by the Speakers of both houses on the Bill. 16. A Select Committee of the Senate may hold a joint sitting with the corresponding Select Committee of the National Assembly to deliberate on matters of mutual interest and concern. (b) a special/an ordinary Bill. I certify that this printed impression is a true copy of the Bill as passed by the [Originating House] on ………………………….and by the [other House] on ………………………………………. and that the two Speakers concurred, pursuant to Article 110(3) of the Constitution, that this is a Bill concerning county governments. I certify that this printed impression is a true copy of the Bill as passed by the [Originating House] on ………………………….and by the [other House] on ………………………………………. and that the two Speakers concurred, pursuant to Article 110(3) of the Constitution, that this is not a Bill concerning county governments in terms of Article 110(1) of the Constitution. Before either House considers a Bill, the Speakers of the National Assembly and Senate shall jointly resolve any question as to whether it is a Bill concerning counties and, if it is, whether it is a special or an ordinary Bill. The Bill provides a framework through which both Houses of Parliament can resolve issues on whether a Bill is a Bill concerning counties and, if it is, whether it is a special or an ordinary Bill. Presently there is no legal framework on how the Speakers of both Houses of Parliament are to enforce concurrence on all the Bills presented to both Houses of Parliament. The Bill therefore provides for the procedure for concurrence on all Bills tabled in either House of Parliament, the dispute resolution on concurrence, and the consequences of non-concurrence on a Bill. The Bill provides for nomination of a joint committee by the Speakers of both Houses of Parliament to resolve any dispute on concurrence on a Bill. The resolution of a joint committee shall bind the Speakers of both Houses of Parliament. The Bill provides that for a Bill to be published in the gazette, the Bill has to be accompanied by a certificate of concurrence from the Speakers of both Houses of Parliament. 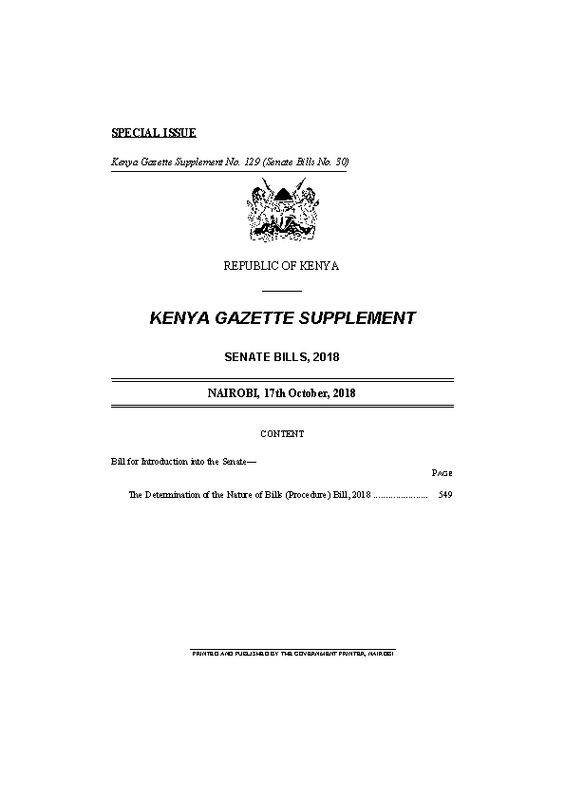 The Bill also provides for referral of an ordinary Bill concerning counties, after the Bill has been passed by one House and transmitted to the other House, to a mediation committee established under Article 113 of the Constitution if a session elapses from the date of the reception of the Bill by the other House without the Bill being passed by it. The Bill also provides for referral of a Bill to the Supreme Court for advisory opinion in instances where the two Speakers fail to concur on whether a Bill is a Bill concerning counties and, if it is, whether it is a special or an ordinary Bill. The Bill also provides that a Bill taken for Presidential Assent has to be accompanied with certificate of concurrence from Speakers of both Houses of Parliament. The Bill does not limit any fundamental rights or freedoms. The Bill is therefore a Bill concerning county governments in terms of Article 110(1)(a) of the Constitution. This Bill is not a money Bill within the meaning of Article 114 of the Constitution. Dated the 27th September, 2018. Created on April 5, 2019, 3:05 p.m.